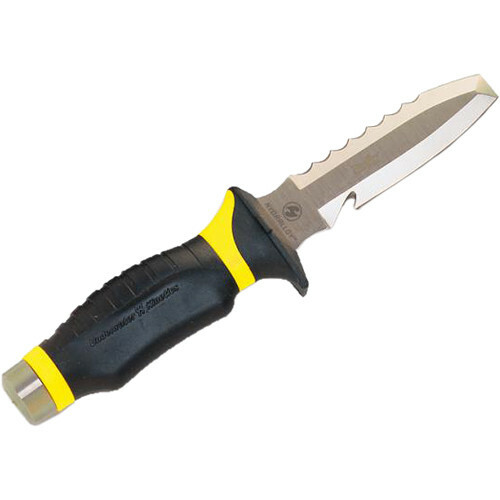 Crafted from Underwater Kinetics' proprietary steel for strength and corrosion resistance, the Blue Tang Hydralloy Blunt Tip Dive Knife with yellow and black handle is a versatile, classically styled diver's tool that will prove its value time after time. It is configured with a blunt tip for prying, a serrated edge for cutting through ropes, lines, and seaweed, and a straight edge for general slicing work, along with a hooked-edge line cutter. The large choil enables a powerful grip. The Blue Tang's stainless-steel signaling pommel is insulated from the blade to avoid metal-to-metal corrosion, and the knife disassembles for cleaning. Box Dimensions (LxWxH) 12.0 x 2.5 x 1.5"